Rendering of Caydon’s 27-story tower, which is under construction in Midtown. Architecture by Ziegler Cooper. Photo credit: Caydon Property via Lovewell Creative. HOUSTON – (Realty News Report) –Australian developer Caydon Property Group has announced plans to develop Laneways, a 2.5 million SF in Midtown, near the intersection of Drew and Dennis streets. The 3.5-acre development will include retail, restaurants, high-rise multifamily and condos, and more. It is modeled after the Laneways development in Melbourne. 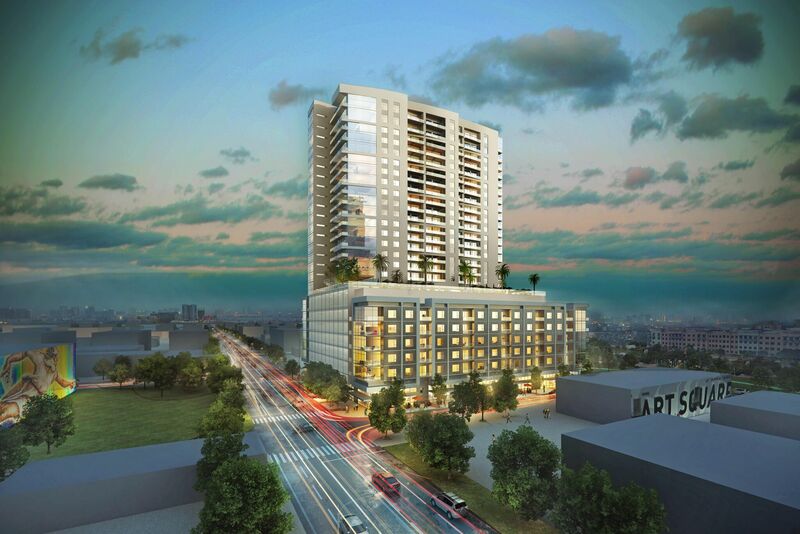 Caydon is currently building a 357-unit high-rise apartment tower at 2850 Fannin in Midtown. The 27-story tower will open later this year. The ultimate vision is a park- and rail-friendly neighborhood, currently home to an estimated 10,000 residents. Caydon’s Phase 2 scope, recently released, calls for three more residential towers comprised of 1,000 multifamily units and 200 condos; 55,000 square feet of eclectic retail with a tenant mix of wellness to wine bars; and a boutique hotel, its operator TBD. The announcement also came with the project’s mod moniker: Laneways. It’s a name and a development concept inspired by the boutique- and bistro-lined alleys of Melbourne’s similarly named pedestrian-centric districts, company sources say. Laneways is expected to break ground in early 2020 on its next stage, at 2711 Main St. The property – comprised of a 1940s-era low-rise building and parking lot – has been occupied by Art Supply on Main Street. Last weekend, it held a moving sale and will open a pop-up space at 5221 Alameda Rd., its website shows. The Laneways project’s 3.5-acre site, assembled in a series of acquisitions, is bound by Main, Tuam, Fannin and McGowen streets. It’s next to Midtown Park, a three-acre amenity with programming as well as greenspace, and is on Metro’s transit red line between downtown and Texas Medical Center. Given that proximity to established hubs of activity and accessibility, the two roads that cut through Laneways — Drew and Dennis streets – are important to the project because they will act as the front door to the future towers and retail, company sources say. Caydon Architecture and Design, the company’s in-house team, based in Melbourne, is handling the project’s conceptual design. Company sources did not share the project budget. Caydon’s first U.S. project – the $200 million 27-story luxury apartment tower on Fannin Street – is slated to welcome its first residents this summer. The tower also has retail space, about 13,000 square feet, to be occupied by Atlanta’s Flying Biscuit Café (with outdoor terrace), the Laneways sales center for the future condos (pricing not yet determined), and a health and wellness concept.